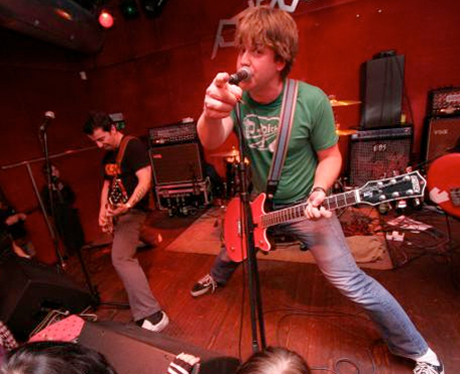 It's been half-a-decade since the world of pop punk was graced with new music from Calgary, AB-based brigade Chixdiggit, their last being ephemeral, yet incredible, 2005 outing Pink Razors. After that release and few sporadic tours though, they vanished. Proving that the recent onslaught of Internet speculation/hearsay about a new release -- sparked by one tune showing up on the latest Fat Wreck Chords compilation, Harder, Fatter + Louder! -- is true, the quartet have announced that they are, in fact, issuing a new release. Dubbed Safeways Here We Come, the seven-song EP will hit store shelves on February 15 via the fine people at Fat. It will be released on CD and twelve-inch vinyl. According to the press release, "Even though it's been six long years since their last record, don't expect any curveballs: this is classic Chixdiggit." We're going to take that as meaning all these songs are love songs. The PR also says to stay tuned for a spring tour dates. For now, you can see the tracklist below. Safeways Here We Come: 1. "Miso Ramen"
3. "Since You Got a Dog"
7. "I Hope Things Will Turn Around"